Ron Paul on CNBC…what makes him different? Or at least it’s kind of like a debate. David Bahnsen has written this piece and Pastor Wilson has responded here. 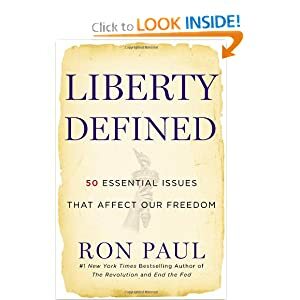 I would think I am the “target audience” for Bahnsen’s article as I have been reliably Republican and conservative in my political approach, but for the last few years I find myself drawn more and more away from the Republicans and toward some of the Libertarians especially Ron Paul. I keep hearing from many Republicans how “crazy” and “anti-semitic” and “dangerous” Ron Paul is (or in Bahnsen’s case how crazy, etc. Ron Paul’s associates are), but I just haven’t seen it. And articles like Bahnsen’s don’t really do much to persuade me as he dramatically undermines his case with his ad hominem attacks. I always think when a writer swerves into personal attacks it’s because he believes his substantive points are not getting the job done. 1) Is it helpful to our long term security to station and engage troops all over the world or not? 2) Should we eliminate centralized control over the money supply or not? I grant there are several other peripheral issues, and who is going to agree on all the issues? I don’t think I even agree with myself on many issues from week to week. Is Ron Paul a perfect candidate? Of course not. Who expects a perfect candidate? But he has successfully given a voice to one side of some of the big issues that had virtually no voice. And he’s made it very plausible to believe that our foreign policy and our monetary policy work hand in glove in a way that undermines our long term liberties. Richard Hershatter offers some insightful thoughts on a Ron Paul presidency, and even argues in the end that Rand Paul would succeed him…this guy is really optimistic. We need more like him. Paul even referenced the long term impact of ignoring the constitution and the War Powers Resolution. “The American people are sick and tired of it. It’s draining us, it’s draining us financially and now we’re into…Afghanistan, Iraq, Pakistan, Libya.” Paul ended his speech by demanding that the executive branch give back to congress the power to send American troops into war. “It should be up to us when we got to war and not to the executive branch,” said Paul. According to Radio Iowa, Paul said that he believes marriage laws should be determined by the states, but called on the Obama administration to defend the Defense of Marriage Act, which defines marriage as being between one man and one woman. Texas Rep. Ron Paul is performing well in the latest CNN poll of potential Republican primary voters.